As I type this, I'm not really sure where my camera is. Or my wallet. And I really wish I knew where I put the book that I was reading. This is the story of my (disorganized) life, and when I got a chance to try out a Clic-It Diaper Bag, I was pretty excited! The premise behind this savvy bag is that all the functions are served by individual add-on accessories that can be attached to the bag when you need them, and removed when you don't. Case in point: I often take my wallet with me in my diaper bag, but then I forget to take it out to put into my purse. The Clic-It bag actually came with a little pouch for my I.D., credit cards, and cash so that I could move it back and forth between my purse and my diaper bag with ease. It also came with a bottle cooler bag and a diaper changing pad with a pocket for a couple of diapers and wipes. If I wanted to travel light, I could remove the extras OR just take the changing portion with me. The bag is super easy to customize. I love that each component snaps easily onto the inside of the bag but won't fall out if I drop my bag. It also comes with an adjustable shoulder strap and a top flap that zips off if you don't want that Messenger bag look. 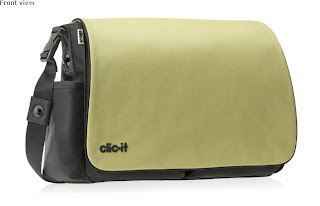 Read more about the Clic-It Bag at their website or "Like" them on Facebook! *Sample was received by Team Mom. Opinions are my own. Yes, I do wanna win! These bags are so cool but, like you said, could get pricey with lots of accessories. I entered the contest at their site. Thanks for posting about it!